From inspiring stories like that of Swapna Barman to awestrucking performances of young , raw & ambitious teenagers, Asian Games 2018, has touched the hearts of millions for more than one reasons. With a tally of 69 medals, India shines bright in the top 10. With a phenomenal record of 15 gold medals, 24 silver medals and 30 bronze metals, we’ve arrived! India won more medals in athletics at the Asiad than any other discipline. 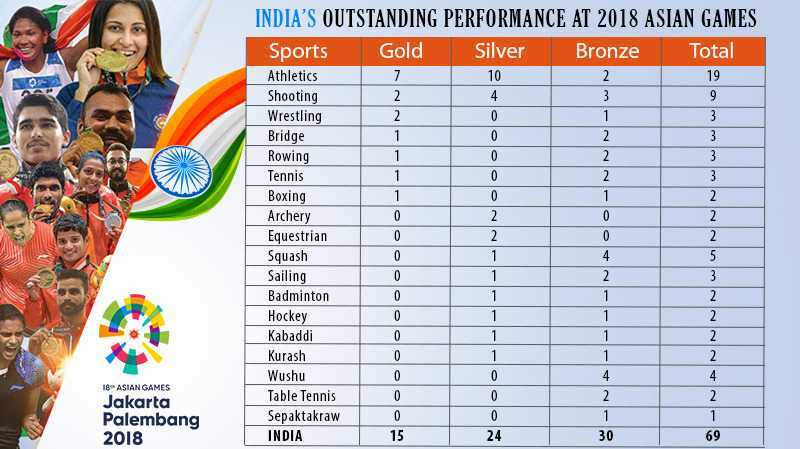 Not just that, India also managed to collect more silver medals than at any other previous games.What helped us stand out is winning medals in sports in which we have not been at our best in the past – like Wushu and Rowing & that signifies a lot more than just victory. Giving us more reasons to celebrate is the fact that the medal-winners include a great number of female athletes along with 15-16-year-old teenagers, indicating how success is inevitable if pursued with sheer dedication & hard work. Analyzing the hits and misses, one can easily say that our performance looked a lot more consistent in comparison with the last Asian Games and is a clear indicator of how we’re ready ! There were numerous bull’s eyes that we didn’t miss at all. Whether it’s winning 2 silver medals at archery or 2 bronze at rowing, or a gold at boxing, the bar has been definitely raised higher, shaping up expectations for tournaments like World Cup and Olympics. Wrestling has struck a gold with Bajrang Punia and Vinesh Phogat. Shooting too spotted some shining stars from the country. India bagged 9 medals from the ranges. Saurabh Chaudhary & Vihan Shardul bought high hopes to the future of the game for future.Pranab Bardhan and Shibnath Sarkar who are 60 and 56 respectively, combined to win India their 15th and final gold in the Asian Games. Bridge was played for the first time in the games and India showed how prepared are they for the challenge with 3 medals. With regards to Table Tennis India managed to finish on the podium for the first time ever. Achnath Sharath Kamal led his way to the bronze medal in men’s team and mixed team events. As India is celebrating & boasting about the commendable performances, what’s inevitable now is the success of INDIAN SPORTS at a global level. It’s safe to now exclaim that INDIA is closer to emergence as a globally acknowledged multi-sporting nation.